If you log on to America’s Bookie you can go into the racebook and wager on any major track on any given day. You can also go into the sportsbook and take your chances on major racing events. For customers who are located in North America, this might mean the Triple Crown races (the Kentucky Derby, Preakness Stakes, Belmont Stakes), perhaps some of the “prep” races for those Triple Crown events, such as the Santa Anita Derby and the Florida Derby; great handicap races like the Travers Stakes; events for fillies like the Kentucky Oaks, international events like the Dubai World Cup, and of course, the Breeders Cup, which is a series of races taking place over a couple of days that crowns “world championships” in a number of different classifications. For each of these races you can see a lineup of the horses in the sportsbook, with the corresponding prices, and you can bet on the winner. And that is excellent enough. But there is something that horse racing in the sportsbook also provides that is quite different than anything you would be able to get at a racetrack. 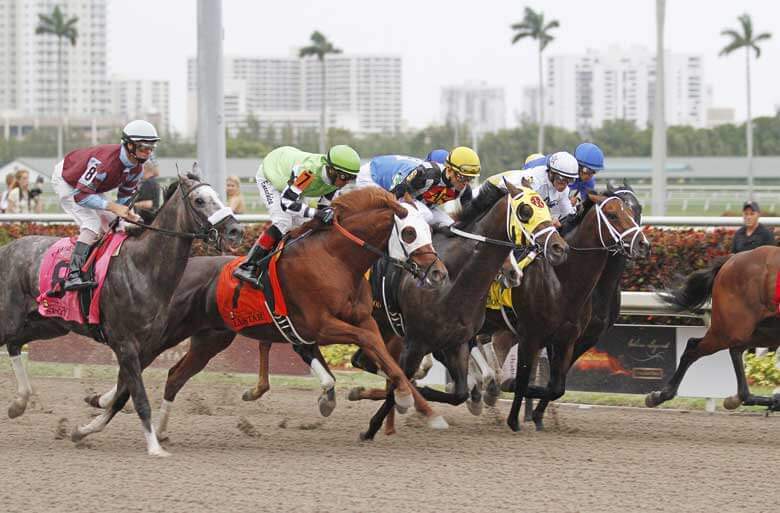 When you get to wager on MATCHUPS, you can take horse racing betting into a whole new dimension at America’s Bookie. It is, for all intents and purposes, an invention of the sportsbook. And this format is available for many of the major races like some of the ones we listed above. There are a number of other propositions that a sportsbook like America’s Bookie could offer that would never be found at a racetrack or other simulcast facility. For major races, these might include: which horse will finish LAST; what the time of the race will be; the price paid on the winner, as well as the perfecta and trifecta payouts, or whether an odd or even number will win the race. So where do people get the right information to make their wagering choices? Well, there are a number of different possibilities, to be certain,. but the most popular has to be the Daily Racing Form, commonly known as “the form,” which includes all the past performances for the major race tracks every day, as well as stories and handicapping opinions by a number of the top racing writers in the country. It is usually available in advance at newsstands and some convenience stores, and it is now published in tabloid form, which makes it easier to handle. It can also be accessed online. It is the home of a statistical device that is commonly used by horse racing handicappers. It is called the Beyer Speed Figure, devised by noted handicapper and Washington Post columnist Andrew Beyer, and it boils down each past performance of a horse to one single number, factoring in many of the conditions that existed in those races, including the track bias. It is just one of many tools that hopeful horse players have at their disposal, on their way to success!